July 27, 1999, J. & S. Shepard. Arctia opulenta is very close in appearance to its congener A. caja, and it was until recently considered to be one of its northern subspecies. It is a large moth (FW length 25 mm). The forewing is white with dark brown gray markings, giving the impression of white lines on a dark background. The hind wing is red with a black discal spot and a series of similar size round black spots filled with metallic blue scales. 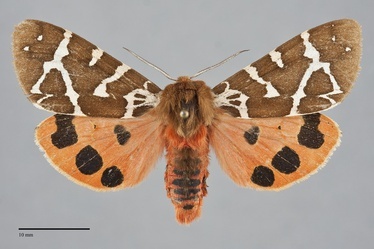 The head and abdomen matches the brown forewing markings and the abdomen is slightly darker red than the hindwings with black spots. The eyes are reduced in size. The bipectinate antennae are white dorsally. Arctia opulenta can be told from A. caja by its smaller size and small eyes, similar in size to other nocturnal moths in A. caja. In addition, the ranges of these species are disjunct with A. opulenta occuring in extreme northern British Columbia while A. caja only occurs in the southern part of the province. Arctia opulenta occurs on arctic tundra in northern Canada and Alaska, and also occurs on alpine and subalpine tundra in mountain areas further south. This species only occurs in northern British Columbia north of the Pacific Northwest. 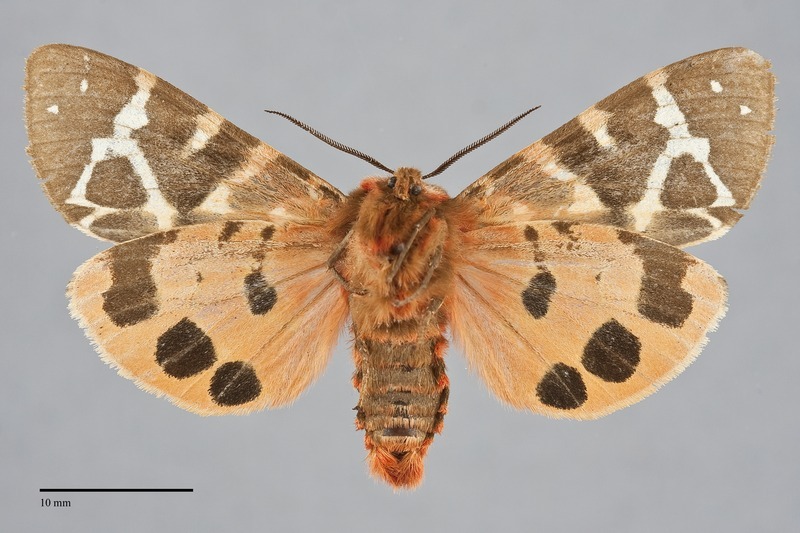 Arctia opulenta has a northerly distribution in western North America, ranging from the North Slope of Alaska to Manitoba. The larvae have been found on willow (Salix spp. - Salicaceae) in British Columbia by Chris Schmidt. Adults of this species are diurnal and fly high and fast above shrubs and tundra.